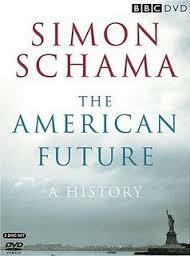 The American Future: A History from the Founding Fathers to Barack Obama. Written for a British audience, The American Future attempts to define the quintessential American national character by tracing historical movements that have shaped US society. The five political movements Schama considers most important are 1) the gradual rise of a professional military officer class, 2) the role of evangelical religion in the movement to abolish slavery, 3) the brutal imperialist war against Mexico and the Philippines, 4) the forced displacement of the Cherokee and four other Native American nations under Andrew Jackson, and 5) the development of large scale irrigation in to open the Southwest desert area to agriculture. • The founding of West Point military academy with its Jeffersonian emphasis on philosophy and civil engineering, as opposed to military tactics. Jefferson believed a sound liberal education for US military officers would help ensure the US never went to war except to defend liberty. Congress consistently refused to fund a US military or naval academy until an undeclared war with France broke out in 1796. * Over a period of ten months, the French seized 300 US merchant vessels. When Congress eventually authorized funding for West Point, its primary purpose was to train the Army Corps of Engineers, who built the levees, bridges, damns, dykes and forts that enabled westward expansion. They also drained the swamp in Washington DC and built the Capitol and other important federal buildings. • President Lyndon Johnson’s role, in 1964, in blocking the credentialing of Mississippi’s Freedom Democratic Party, led by Fannie Lou Hamer, after the Mississippi Democratic Party declared their support for the Republican candidate Barry Goldwater. This blatant white cronyism would provide major impetus to the growing black power movement. • The profound religious intolerance that persisted in the US even after the 1780 adoption of the Bill of Rights guaranteeing separation of church and state. ** In Massachusetts, Sunday church attendance was compulsory until 1833 – until 1840, blasphemy could be punished by one year in prison, public whipping or the pillory. In Maryland Jews weren’t allowed to vote or hold office until the state passed the Jew Bill in 1820. • Anti-immigrant feelings, especially against Germans, Irish, Mexicans and Chinese were so intense during the 19th century that there were frequent riots in which immigrants were lynched or had their homes set on fire. An 1855 riot in Louisville would have affected my great grandfather, whose family arrived in the area after immigrating from Germany in 1840. • President Teddy Roosevelt’s 1902 National Reclamation Act, which led to the construction of 600 dams (including Grand Coulee and Hoover Dam) in thirty years. These would provide irrigation to millions of acres of desert in California and the Southwest. This project would include the diversion of the Colorado River to supply Southern California’s Imperial Valley, which supplies nearly half the fresh fruit and vegetables consumed by Americans, as well as Los Angeles, San Diego, Phoenix and parts of Mexico. *Prior to reading this book, I had no idea the US and France had been at war (with each other). **The early view of the Bill of Rights was that it only pertained to the federal government and didn’t apply to state law. The theme of A Short History of Progress is social collapse. In it, Canadian historical archeologist Ronald Wright summarizes humankind’s biological and cultural evolution, as well as tracing the role of ecological destruction in the collapse of the some of the most significant civilizations (Sumer, Mesopotamia, Greece, Rome, Easter Island and the Mayan civilization). Exhaustively researched, the book advances the theory that many of colossal blunders made by modern leaders are very old mistakes made by earlier civilizations. Wright starts with the mystery of the agricultural revolution that occurred around 10,000 BC, when Homo sapiens ceased to rely on hunting and berry-picking and began growing their own food. Twelve thousand years ago, the global population was still small enough that there was more than ample wild food to feed them. Yet for some reason, a half dozen human settlements in widely separated regions simultaneously domesticated plants and animals. Why? Citing extensive geological and archeological evidence, Wright suggests plant and animal domestication may have been triggered by unprecedented climate stability. Prior to 10,000 BC, the earth’s climate was wildly unstable, with ice ages developing and abating over periods as short as a decade or so. These sudden periodic changes in climate forced our hunter gatherer ancestors to continually migrate in search of food. The climate stabilization that occurred following the last ice age (around 10,000 BC) enabled them to settle in larger groups, save seeds to cultivate crops that took months to harvest, and engage in trade for other basic necessities. Wright goes on to describe a number of diverse civilizations that arose and collapsed between 4,000 and 1,000 BC – and their unfortunate tendency towards mindless habitat destruction and runaway population growth, consumption, and technological development. In each case, an identical social transformation takes place as resources become increasingly scarce. As prehistoric peoples find it harder and harder to feed themselves, inevitably a privileged elite emerges to confiscate communal lands and enslave their inhabitants. They then install a despotic tyrant who hastens ecological collapse by wasting scare resources on a spree of militarization and temple or pyramid building. This process is almost always accompanied by wholesale murder, torture, and unproductive wars. 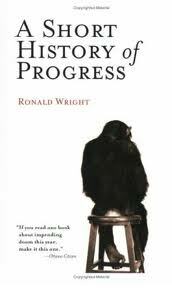 Wright relates this typical pattern of ecological destruction and collapse to a series of “progress traps,” in which specific human inventions turn out to have extremely negative unintended consequences. Instead of fixing the underlying problem they’re meant to solve, the inventions create an even worse environmental mess. It’s a pattern so common in prehistory that it’s become enshrined in the Adam and Eve and similar creation myths. All describe how the quest for knowledge ended humankind’s access to freely available and abundant food and forced them to produce their own. According to Wright, the first of these “progress traps” was the invention of weapons (for hunting) by early Homo sapiens. Wright blames this early invention of weapons for the first (archeologically) recorded instance of genocide – namely the wiping out of Homo Neanderthalis (Neanderthal man) by Cro-Magnon man between 40,000 and 30,000 BC. This was followed by other important mass extinctions as Homo sapiens spread out across the globe between 30,000 and 15,000 BC. The most recent archeological evidence suggests the mammoth, camel and horse became extinct in North America during this period because of perfected hunting techniques that allowed human beings to carry out mass slaughters (involving as many as 1,000 mammoths or 100,000 horses simultaneously). Some archeologists attribute the end of hunting as a predominate food source (in numerous regions simultaneously) and the rise of plant-based diets to the decline in game animals stemming from this indiscriminate slaughter. The birth of agriculture, in turn leads to widespread deforestation and soil erosion in all the ancient civilizations, accompanied by soil salinization from over-irrigation. According to Wright, the entire cycle takes around a thousand years, which happens to be the average lifespan of most historic civilizations. The first civilization to collapse in this way was Sumer (in southern Iraq), which flourished between 3,000 and 2,000 BC. The Sumerians invented irrigation, the city, the corporation (in the form of priestly bureaucracies), writing (for trade purposes), hereditary kings and slavery. By 2,500 BC, soil salinization (from irrigation) had caused a massive drop-off in crop yields. Instead of implementing environmental reforms, the ruling elite tried to intensify production by confiscating communal lands, introducing slavery and human sacrifice and engaging in chronic warfare. From Sumer the cradle of civilization moved north to Mesopotamia (Babylon), in the region of northern Iraq and Syria, and humankind created one of the first man made deserts out of a region lush in date palms and other native vegetation. Around 1,000 BC, similar civilizations also appeared in India, China, Mexico, Peru and parts of Europe. The Greeks (around 600 BC) were the first with any conscious awareness that they were destroying their own habitat. Plato writes a vivid description of the dangers of erosion and runoff from deforestation. The Athenian leader Solon tried to halt increasing ecological devastation by outlawing debt serfdom, food exports, and farming on steep slopes. Pisistratus offered grants to farmers to plant olive trees for soil reclamation. Wright makes a good case for similar environmental destruction, rather than barbarian invasion, causing Rome to collapse. By the time of Augustus, Italian land had become so degraded that Rome was forced to import most of their food from North Africa, Gaul, and other colonies. The most interesting section of the book concerns the role the New World played in rescuing the environmentally decimated European civilization. According to Wright, it was mainly New World gold and silver that capitalized the industrial revolution. However he also stresses the importance of the New World foods that were added to the European diet at a point where the population had outstripped their food supply. Maize (sweet corn) and potatoes are twice as productive (in terms of calories per acre) as wheat and barley, the traditional European staples. He also makes the point – ominously – that, despite all our apparent technological progress, humankind hasn’t introduced one new food since the Stone Age. In fact, Homo sapiens hasn’t evolved culturally or intellectually since our ancestors failed to confront resource scarcity in a way conducive to their survival. If anything, given mass extinctions, potentially catastrophic climate change, and a growing scarcity of energy, water and fertile soil, we seem to be repeating the old maladaptive pattern. As examples, Wright cites the idiotic war on terrorism, which has ironic parallels with the chronic warfare the Sumerians launched 4,000 years ago. He also cites the rise of the New Right and the folly of trying to address resource scarcity by consolidating wealth and power in the hands of a tiny elite.